Single side Spinning plant with single extruder up to a 60/30. 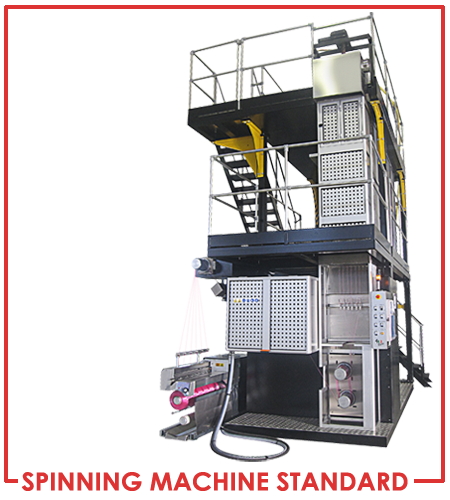 It can be configured with different Spinning head electrically heated and equipped from 2 up to 6 Spinerettes, with or without hydraulic split. The Quencing system provided is Expero series with independent zones, on request an air to air chiller can be provided. Draw section is provided with first quality Retech rolls, each roll is coupled with motor driven by inverter. Spin finish system equipped with first quality ceramic and air tangling provided by primary brands. The machine is equipped with a full digital automation system with a PLC and touch screen interface to manage the plant. 4M Plants has developed an easy and intuitive software to control the spinning plant: extruder, spinning head, Quencing, spin finish, draw section and air tangling unit are all managed from a touch screen. All the automation elements and the inverters installed onboard are of first quality brands. The smallest Onmia standard can be installed and put into production in one day.